Lutetium is a chemical element wi the seembol Lu an atomic nummer 71. It is a sillery white metal which resists corrosion in dry, but nae in moist, air. 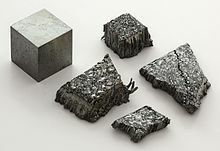 It is the last element in the lanthanide series, an tradeetionally coontit amang the rare yirds.